This small kitchen was short on storage and design. We removed all the cabinets, appliances and ceiling. The new cabinet layout provides twice as much storage in a more functional layout. On the left, the refrigeration is a 2-drawer unit with a refrigerator on top and a freezer below, perfect for this active senior couple. A new cooktop with a microwave/hood above provides an efficient work zone. The Caesarstone counters throughout complete the contemporary look that is easy to keep clean. 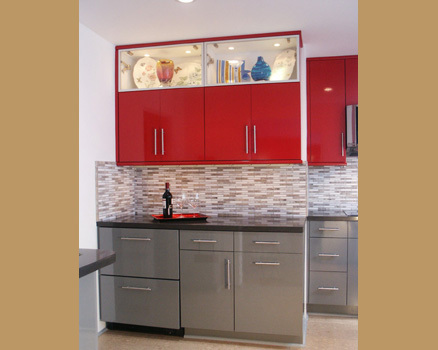 The multi-stone backsplash blends the tones of the white walls, the gray cabinets and Caesarstone. A breakfast area with stools was positioned at the windows so they could enjoy the view. New lighting was provided throughout for general ambience and for task lighting. New cork flooring was installed in a gray tone to accent the cabinets and provide a comfortable material with low maintenance. They no longer dread having to go into the kitchen, and have invited all their friends to visit and enjoy.